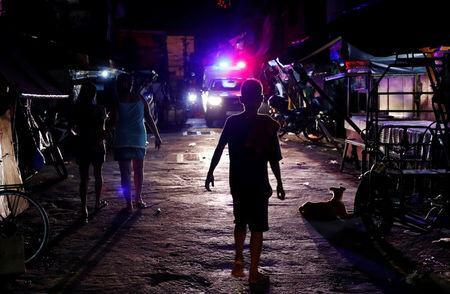 MANILA (Reuters) - Each night, police in teams of about a dozen fan out across the most rundown areas of the Philippine capital, rounding up slum-dwellers who linger in the streets, or teenagers who play in makeshift computer gaming shops. Children scavenging on mountains of trash are ordered home, their parents warned of jail if minors are seen out late again. Men found shirtless, and those smoking or drinking alcohol outdoors are taken to district offices, cautioned, and their names and addresses recorded. 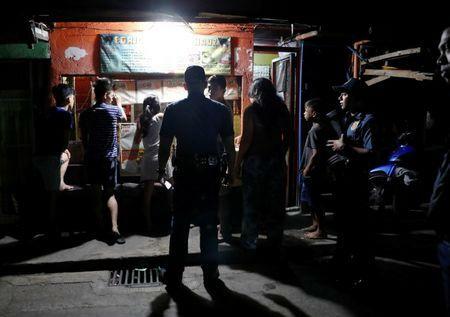 This is a war on loitering - instigated by Philippine President Rodrigo Duterte, famous for his bloody war on drugs and his obsession with social order. Duterte launched it out of the blue on June 13 during one of his trademark rambling speeches, when he said people hanging out in the streets should be ordered home, and if they refused, he would personally tie their hands and drop them into a river. Manila police took that as a directive, implementing it with gusto and some 59,000 people have since been apprehended. 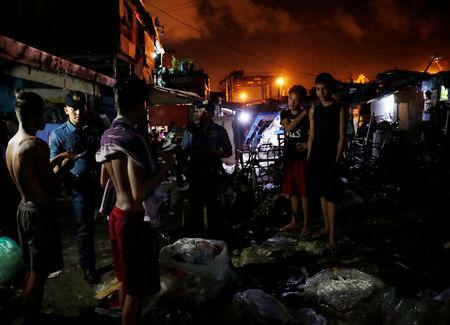 The crackdown has been condemned by activists, legal groups and opposition lawmakers, who say it has no legal basis as vagrancy was decriminalised in 2012 and that Duterte is again harassing Manila's poor, already traumatised by the war on drugs. "This is all about imposing control on the poor, by using force or the threat of force to intimidate them. What for? The intention is to keep them from resisting, from fighting back," said Antonio Tinio, an opposition Congressman. But Duterte, who says the anti-loitering crackdown is a "crime prevention campaign", has not suffered any backlash. His public support ratings, built on the back of his reputation as disciplinarian who gets things done, remain high. A Pulse Asia poll conducted last month showed 88 percent of Filipinos approved of Duterte's performance as president. Formerly a mayor for two decades, Duterte built his career on his 'tough-on-crime' image. When he ran for president, he promised to kill thousands of narcotics dealers. In his two years in office, police have done just that, killing at least 4,500 people they say were drug suspects who resisted arrest. In his annual State of the Nation Address on Monday, Duterte vowed the war on drugs would continue to be "relentless and chilling". In its first week, the anti-loitering drive also resulted in death. Genesis Argoncillo, a 25-year old arrested for not wearing a shirt, died after being beaten by his cellmates. Since then, fewer people are being held overnight or longer in Manila's notoriously overcrowded police station cells. Most are booked and freed, about a third are fined and some are charged with offences. Two resolutions by a congressman and by a senator calling for a legislative probe into the crackdown were filed on June 26, although it is unclear whether one will be launched. Duterte commands a big majority in both the Congress and the Senate. Vice President Leni Robredo, elected separately to Duterte, says police now have a licence to abuse and lawyers should help poor communities to know their rights. The National Union of Public Lawyers has likened the campaign to martial law under Ferdinand Marcos from 1972 to 1981. "Such police state tactics were historically experimented or resorted to by fascist dictators to ultimately silence critics and resistance," it said. Presidential spokesman Harry Roque did not respond to a request for comment on the comparison with martial law. But he has denied the campaign is anti-poor and argues police are just targeting violations of city ordinances and laws. Duterte has also denied ordering arrests of loiterers, saying he told police only to frisk people. He argues the measures are legal as he can invoke the principle of "parens patriae" (parent of the nation), and recently told police to follow orders and ignore "deranged constitutionalists" questioning the legality of the drive. Mark Lopez, a pro-Duterte blogger, said crime was a big problem and the public welcomed Duterte's approach, regardless of what his opponents say. "They really want to create this fear among the people that the president is anti-poor," Lopez said. "The president is just reminding the police to enforce existing laws." While two inmates have been charged over Argoncillo's death and five police removed, outrage over the crackdown has been limited. One exception was the arrest of several call centre workers chatting on the street having just finished their night shift. The news went viral and two officers in Manila's main business district were fired. "They (the police) made us watch the declaration of President Rodrigo Duterte about the anti-loitering law ... They told us, 'because the president said it, it is immediately a law'," one of the workers wrote on her Facebook page. John Ribo, who works at a law firm, said the problem was that police did not know how to implement the campaign. "It's too much," he said. "I'm more concerned I'll get arrested by police who want to earn more money."